I took today (Friday) off work … the weather has been so nice the past few days, and since I didn’t get a chance to ski last weekend due to digestive issues related to a change in diet (8 pounds lost so far! ), I was going stir-crazy by Wednesday. Put in for a vacation day for today, and was thankfully approved, allowing me a three-day weekend. Woke up early this morning planning to head up to Alta, but got distracted and ended up leaving a little later than I had originally intended, so I headed up to Solitude instead. Easier and closer parking, and a lot fewer people, especially on a weekday. Met up with the Trib Reporter a little bit before noon, and spent the rest of the afternoon up and around Summit / Corner Chute and Honeycomb Canyon. On the last run of the day, I took a pretty spectacular (I’m told) tumble on the runout through the trees towards the bottom of the Boundary Chutes in Honeycomb Canyon … I’m told I did a triple somersault. I know I completed a perfect one-point landing … on my face. I know I thought that the runout looked somewhat packed, so I could just straightline it through the trees onto Woodlawn, but the snow in that spot was a lot softer than I expected, and my tips sunk in. My right ski ended up about 30 feet behind where I augered, and my left ski about 7-8 feet back, vertical, buried from tip to binding. That must have happened on the second flip. I’m not hurt but did get a little shaken up … it took more effort than I expected it would to make it back to Honeycomb Return, so in the interest of self-preservation, I decided to call it a day on the way back up to Eagle Ridge, thankful that I didn’t pull a Sonny Bono and that the Trib Reporter didn’t have to turn our afternoon into a front page news item. I figured two more runs … one from the Ridge back to Moonbeam, and then one more, but decided to skip the last one once I got back to Moonbeam Lodge. 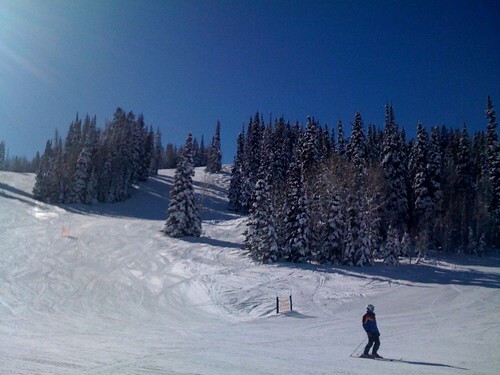 Gorgeous day, absolutely bluebird … and it felt like there were only 7 or 8 people skiing on the mountain. Everyone was busy eating brats and burgers and drinking beer at the Sunshine Grill mid-mountain at the bottom of Sunshine Bowl between the Moonbeam and Eagle Express lifts.